"Nicholas II" redirects here. For other uses, see Nicholas II (disambiguation). Nicholas II or Nikolai II (Russian: Никола́й II Алекса́ндрович, tr. Nikolai II Aleksandrovich; 18 May [O.S. 6 May] 1868 – 17 July 1918), known as Saint Nicholas the Passion-Bearer in the Russian Orthodox Church, was the last Emperor of Russia, ruling from 1 November 1894 until his forced abdication on 15 March 1917. His reign saw the fall of the Russian Empire from one of the foremost great powers of the world to economic and military collapse. He was given the nickname Nicholas the Bloody or Vile Nicholas by his political adversaries due to the Khodynka Tragedy, anti-Semitic pogroms, Bloody Sunday, the violent suppression of the 1905 Russian Revolution, the execution of political opponents, and his perceived responsibility for the Russo-Japanese War (1904–1905). Soviet historians portrayed Nicholas as a weak and incompetent leader whose decisions led to military defeats and the deaths of millions of his subjects. Russia was defeated in the 1904–1905 Russo-Japanese War, which saw the annihilation of the Russian Baltic Fleet at the Battle of Tsushima, the loss of Russian influence over Manchuria and Korea, and the Japanese annexation to the north of South Sakhalin Island. The Anglo-Russian Entente was designed to counter the German Empire's attempts to gain influence in the Middle East, but it also ended the Great Game of confrontation between Russia and Britain. When all diplomatic efforts to prevent the First World War (1914–1918) failed, Nicholas approved the mobilization of the Russian Army on 30 July 1914, which gave Germany formal grounds to declare war on Russia on 1 August 1914. An estimated 3.3 million Russians were killed in World War I. The Imperial Army's severe losses, the High Command's incompetent management of the war effort, and lack of food and supplies on the home front were all leading causes of the fall of the House of Romanov. Following the February Revolution of 1917, Nicholas abdicated on behalf of himself and his son and heir, Alexei. He and his family were imprisoned and transferred to Tobolsk in late summer 1917. 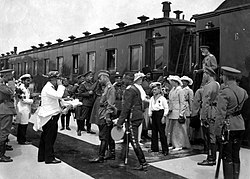 On 30 April 1918, Nicholas, Alexandra, and their daughter Maria were handed over to the local Ural Soviet council in Ekaterinburg; the rest of the captives followed on 23 May. Nicholas and his family were executed by their Bolshevik guards on the night of 16/17 July 1918. 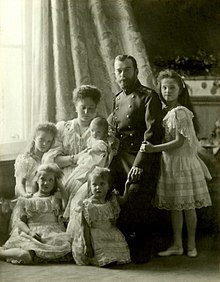 The remains of the imperial family were later found, exhumed, identified and re-interred with an elaborate state and church ceremony in St. Petersburg on 17 July 1998. In 1981, Nicholas, his wife, and their children were recognized as martyrs by the Russian Orthodox Church Outside Russia in New York City. On 15 August 2000, they were canonized by the Russian Orthodox Church as passion bearers, commemorating believers who face death in a Christ-like manner. Nicholas was born in the Alexander Palace in Saint Petersburg, Russian Empire, the eldest child of Emperor Alexander III and Empress Maria Feodorovna of Russia (née Princess Dagmar of Denmark). He had five younger siblings: Alexander (1869–1870), George (1871–1899), Xenia (1875–1960), Michael (1878–1918) and Olga (1882–1960). Nicholas often referred to his father nostalgically in letters after Alexander's death in 1894. He was also very close to his mother, as revealed in their published letters to each other. 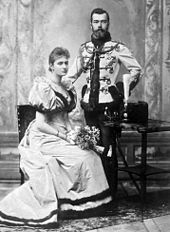 His paternal grandparents were Emperor Alexander II and Empress Maria Alexandrovna (née Princess Marie of Hesse and by Rhine). His maternal grandparents were King Christian IX and Queen Louise of Denmark. Nicholas was of primarily German and Danish descent, his last ethnically Russian ancestor being Grand Duchess Anna Petrovna of Russia (1708–1728), daughter of Peter the Great. Nicholas was related to several monarchs in Europe. His mother's siblings included Kings Frederick VIII of Denmark and George I of Greece, as well as the United Kingdom's Queen Alexandra (consort of King Edward VII). Nicholas, his wife Alexandra, and German Emperor Wilhelm II were all first cousins of King George V of the United Kingdom. Nicholas was also a first cousin of both King Haakon VII and Queen Maud of Norway, as well as King Christian X of Denmark and King Constantine I of Greece. 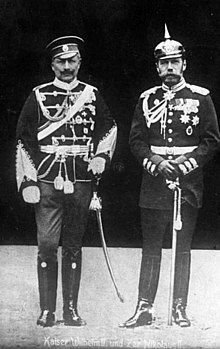 Nicholas and Wilhelm II were in turn second cousins-once-removed, as each descended from King Frederick William III of Prussia, as well as third cousins, as they were both great-great-grandsons of Tsar Paul I of Russia. In addition to being second cousins through descent from Louis II, Grand Duke of Hesse and his wife Princess Wilhelmine of Baden, Nicholas and Alexandra were also third cousins-once-removed, as they were both descendants of King Frederick William II of Prussia. Tsar Nicholas II was the first cousin-once-removed of Grand Duke Nicholas Nikolaevich. To distinguish between them the Grand Duke was often known within the imperial family as "Nikolasha" and "Nicholas the Tall", while the Tsar was "Nicholas the Short". In his childhood, Nicholas, his parents and siblings made annual visits to the Danish royal palaces of Fredensborg and Bernstorff to visit his grandparents, the king and queen. The visits also served as family reunions, as his mother's siblings would also come from the United Kingdom, Germany and Greece with their respective families. It was there in 1883, that he had a flirtation with one of his English first cousins, Princess Victoria. In 1873, Nicholas also accompanied his parents and younger brother, two-year-old George, on a two-month, semi-official visit to England. In London, Nicholas and his family stayed at Marlborough House, as guests of his "Uncle Bertie" and "Aunt Alix", the Prince and Princess of Wales, where he was spoiled by his uncle. 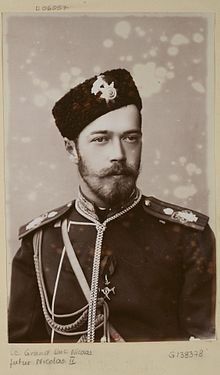 On 1 March 1881, following the assassination of his grandfather, Tsar Alexander II, Nicholas became heir apparent upon his father's ascension as Alexander III. Nicholas and his other family members bore witness to Alexander II's death, having been present at the Winter Palace in Saint Petersburg, where he was brought after the attack. For security reasons, the new tsar and his family relocated their primary residence to the Gatchina Palace outside the city, only entering the capital for various ceremonial functions. On such occasions, Alexander III and his family occupied the nearby Anichkov Palace. In 1884, Nicholas's coming-of-age ceremony was held at the Winter Palace, where he pledged his loyalty to his father. Later that year, Nicholas's uncle, Grand Duke Sergei Alexandrovich, married Princess Elizabeth, daughter of Louis IV, Grand Duke of Hesse and his late wife Princess Alice of the United Kingdom (who had died in 1878), and a granddaughter of Queen Victoria. At the wedding in St. Petersburg, the sixteen-year-old Tsarevich met with and admired the bride's youngest surviving sister, twelve-year-old Princess Alix. Those feelings of admiration blossomed into love following her visit to St. Petersburg five years later in 1889. Alix had feelings for him in turn. As a devout Lutheran, she was initially reluctant to convert to Russian Orthodoxy in order to marry Nicholas, but later relented. In 1890 Nicholas, his younger brother George, and their cousin Prince George of Greece, set out on a world tour, although Grand Duke George fell ill and was sent home partway through the trip. Nicholas visited Egypt, India, Singapore, and Bangkok, receiving honors as a distinguished guest in each country. In April 1891, in the city of Ōtsu, Japan, Nicholas was attacked by a deranged Japanese police officer. The incident cut his trip short. Returning overland to St. Petersburg, he was present at the ceremonies in Vladivostok commemorating the beginning of work on the Trans-Siberian Railway. In 1893, Nicholas traveled to London on behalf of his parents to be present at the wedding of his cousin the Duke of York to Princess Mary of Teck. Queen Victoria was struck by the physical resemblance between the two cousins, and their appearances confused some at the wedding. During this time, Nicholas had an affair with St. Petersburg ballerina Mathilde Kschessinska. Though Nicholas was heir-apparent to the throne, his father failed to prepare him for his future role as tsar. He attended meetings of the State Council; however, as his father was only in his forties, it was expected that it would be many years before Nicholas succeeded to the throne. Sergei Witte, Russia's finance minister, saw things differently and suggested to the tsar that Nicholas be appointed to the Siberian Railway Committee. Alexander argued that Nicholas was not mature enough to take on serious responsibilities, to which Witte replied that if Nicholas was not introduced to state affairs, he would never be ready to understand them. Alexander's assumptions that he would live a long life and had years to prepare Nicholas for becoming tsar proved wrong, as by 1894, Alexander's health was failing. In April 1894, Nicholas joined his Uncle Sergei and Aunt Elizabeth on a journey to Coburg, Germany, for the wedding of Elizabeth's and Alix's brother, Ernest Louis, Grand Duke of Hesse, to their mutual first cousin Princess Victoria Melita of Saxe-Coburg and Gotha. Other guests included Queen Victoria, Kaiser Wilhelm II, the Empress Frederick (Kaiser Wilhelm's mother and Queen Victoria's eldest daughter), Nicholas's uncle, the Prince of Wales, and the bride's parents, the Duke and Duchess of Saxe-Coburg and Gotha. Once in Coburg Nicholas proposed to Alix, but she rejected his proposal, being reluctant to convert to Orthodoxy. But the Kaiser later told her she had a duty to marry Nicholas and to convert, as her sister Elizabeth had voluntarily done in 1892. Thus Nicholas and Alix became officially engaged on 20 April 1894. Nicholas's parents initially hesitated to give the engagement their blessing, as Alix had made poor impressions during her visits to Russia. They gave their consent only when they saw Tsar Alexander's health deteriorating. That summer, Nicholas travelled to England to visit both Alix and the Queen. The visit coincided with the birth of the Duke and Duchess of York's first child, the future King Edward VIII. Along with being present at the christening, Nicholas and Alix were listed among the child's godparents. After several weeks in England, Nicholas returned home for the wedding of his sister, Xenia, to a cousin, Grand Duke Alexander Mikhailovich ("Sandro"). By that autumn, Alexander III lay dying. Upon learning that he would live only a fortnight, the Tsar had Nicholas summon Alix to the imperial palace at Livadia. Alix arrived on 22 October; the Tsar insisted on receiving her in full uniform. From his deathbed, he told his son to heed the advice of Witte, his most capable minister. Ten days later, Alexander III died at the age of forty-nine, leaving twenty-six-year-old Nicholas as Emperor of Russia. That evening, Nicholas was consecrated by his father's priest as Tsar Nicholas II and, the following day, Alix was received into the Russian Orthodox Church, taking the name Alexandra Feodorovna with the title of Grand Duchess and the style of Imperial Highness. Nicholas may have felt unprepared for the duties of the crown, for he asked his cousin and brother-in-law, Grand Duke Alexander, "What is going to happen to me and all of Russia?" Though perhaps under-prepared and unskilled, Nicholas was not altogether untrained for his duties as Tsar. Nicholas chose to maintain the conservative policies favoured by his father throughout his reign. While Alexander III had concentrated on the formulation of general policy, Nicholas devoted much more attention to the details of administration. Leaving Livadia on 7 November, Tsar Alexander's funeral procession—which included Nicholas's paternal aunt Queen Olga of Greece, and the Prince and Princess of Wales—arrived in Moscow. After lying in state in the Kremlin, the body of the Tsar was taken to St. Petersburg, where the funeral was held on 19 November. Nicholas and Alix's wedding was originally scheduled for the spring of 1895, but it was moved forward at Nicholas's insistence. Staggering under the weight of his new office, he had no intention of allowing the one person who gave him confidence to leave his side. Instead, Nicholas's wedding to Alix took place on 26 November 1894, which was the birthday of the Dowager Empress Marie Feodorovna, and court mourning could be slightly relaxed. Alexandra wore the traditional dress of Romanov brides, and Nicholas a hussar's uniform. Nicholas and Alexandra, each holding a lit candle, faced the palace priest and were married a few minutes before one in the afternoon. Despite a visit to the United Kingdom in 1893, where he observed the House of Commons in debate and seemingly impressed by the machinery of constitutional monarchy, Nicholas turned his back on any notion of giving away any power to elected representatives in Russia. Shortly after he came to the throne, a deputation of peasants and workers from various towns' local assemblies (zemstvos) came to the Winter Palace proposing court reforms, such as the adoption of a constitutional monarchy, and reform that would improve the political and economic life of the peasantry, in the Tver Address. ... it has come to my knowledge that during the last months there have been heard in some assemblies of the zemstvos the voices of those who have indulged in a senseless dream that the zemstvos be called upon to participate in the government of the country. I want everyone to know that I will devote all my strength to maintain, for the good of the whole nation, the principle of absolute autocracy, as firmly and as strongly as did my late lamented father. On 26 May 1896, Nicholas's formal coronation as Tsar was held in Uspensky Cathedral located within the Kremlin. The Silk Imperial Crown Of Russia was used, as an official coronation gift of the Russian Empire. Nicholas II was the first and only monarch to be presented with such a monumental coronation gift. It was not intended as ceremonial regalia, but as private Imperial property, a memento to his coronation. In a celebration on 27 May 1896, a large festival with food, free beer and souvenir cups was held in Khodynka Field outside Moscow. Khodynka was chosen as the location as it was the only place near Moscow large enough to hold all of the Moscow citizens. Khodynka was primarily used as a military training ground and the field was uneven with trenches. Before the food and drink was handed out, rumours spread that there would not be enough for everyone. As a result, the crowd rushed to get their share and individuals were tripped and trampled upon, suffocating in the dirt of the field. Of the approximate 100,000 in attendance, it is estimated that 1,389 individuals died and roughly 1,300 were injured. The Khodynka Tragedy was seen as an ill omen and Nicholas found gaining popular trust difficult from the beginning of his reign. The French ambassador's gala was planned for that night. The Tsar wanted to stay in his chambers and pray for the lives lost, but his uncles believed that his absence at the ball would strain relations with France, particularly the 1894 Franco-Russian Alliance. Thus Nicholas attended the party; as a result the mourning populace saw Nicholas as frivolous and uncaring. During the autumn after the coronation, Nicholas and Alexandra made a tour of Europe. After making visits to the emperor and empress of Austria-Hungary, the Kaiser of Germany, and Nicholas's Danish grandparents and relatives, Nicholas and Alexandra took possession of their new yacht, the Standart, which had been built in Denmark. From there, they made a journey to Scotland to spend some time with Queen Victoria at Balmoral Castle. While Alexandra enjoyed her reunion with her grandmother, Nicholas complained in a letter to his mother about being forced to go shooting with his uncle, the Prince of Wales, in bad weather, and was suffering from a bad toothache. The first years of his reign saw little more than continuation and development of the policy pursued by Alexander III. Nicholas allotted money for the All-Russia exhibition of 1896. In 1897 restoration of gold standard by Sergei Witte, Minister of Finance, completed the series of financial reforms, initiated fifteen years earlier. By 1902 the Trans-Siberian Railway was nearing completion; this helped the Russians trade in the Far East but the railway still required huge amounts of work. In foreign relations, Nicholas followed the policies of his father, strengthening the Franco-Russian Alliance and pursuing a policy of general European pacification, which culminated in the famous Hague peace conference. This conference, suggested and promoted by Nicholas II, was convened with the view of terminating the arms race, and setting up machinery for the peaceful settlement of international disputes. The results of the conference were less than expected due to the mutual distrust existing between great powers. Nevertheless, the Hague conventions were among the first formal statements of the laws of war. In 1901, Nicholas II and the famous Russian diplomat Friedrich Martens were nominated for the Nobel Peace Prize, for the initiative to convene the Hague Peace Conference and contributing to its implementation. In 1903, Nicholas threw himself into an ecclesiastical crisis regarding the canonisation of Seraphim of Sarov. The previous year, it had been suggested that if he were canonised, the imperial couple would beget a son and heir to throne. While Alexandra demanded in July 1902 that Seraphim be canonised in less than a week, Nicholas demanded that he be canonised within a year. Despite a public outcry, the Church bowed to the intense imperial pressure, declaring Seraphim worthy of canonisation in January 1903. That summer, the imperial family travelled to Sarov for the canonisation. The Russian Baltic Fleet was annihilated by the Japanese at the Battle of Tsushima. A clash between Russia and the Empire of Japan was almost inevitable by the turn of the 20th century. Russia had expanded in the Far East, and the growth of its settlement and territorial ambitions, as its southward path to the Balkans was frustrated, conflicted with Japan's own territorial ambitions on the Chinese and Asian mainland. Nicholas pursued an aggressive foreign policy with regards to Manchuria and Korea, and strongly supported the scheme for timber concessions in these areas as developed by the Bezobazov group. War began in February 1904 with a preemptive Japanese attack on the Russian fleet in Port Arthur, prior to a formal declaration of war. With the Russian Far East fleet trapped at Port Arthur, the only other Russian Fleet was the Baltic Fleet; it was half a world away, but the decision was made to send the fleet on a nine-month voyage to the East. The United Kingdom would not allow the Russian navy to use the Suez Canal, due to its alliance with the Empire of Japan, and due to the Dogger Bank incident where the Baltic Fleet mistakenly fired on British fishing boats in the North Sea. The Russian Baltic Fleet traversed the world to lift the blockade on Port Arthur, but after many misadventures on the way, was nearly annihilated by the Japanese in the Battle of the Tsushima Strait. On land the Imperial Russian Army experienced logistical problems. While commands and supplies came from St. Petersburg, combat took place in east Asian ports with only the Trans-Siberian Railway for transport of supplies as well as troops both ways. The 9,200-kilometre (5,700 mi) rail line between St. Petersburg and Port Arthur was single-track, with no track around Lake Baikal, allowing only gradual build-up of the forces on the front. Besieged Port Arthur fell to the Japanese, after nine months of resistance. Nicholas's stance on the war was something that baffled many. He approached the war with confidence and saw it as an opportunity to raise Russian morale and patriotism, paying little attention to the financial repercussions of a long-distance war. Shortly before the Japanese attack on Port Arthur, Nicholas held firm to the belief that there would be no war. Despite the onset of the war and the many defeats Russia suffered, Nicholas still believed in, and expected, a final victory, maintaining an image of the racial inferiority and military weakness of the Japanese. As Russia faced imminent defeat by the Japanese, the call for peace grew. Nicholas's mother, as well as his cousin Emperor Wilhelm II, urged Nicholas to negotiate for peace. Despite the efforts, Nicholas remained evasive, sending a telegram to the Kaiser on 10 October that it was his intent to keep on fighting until the Japanese were driven from Manchuria. It was not until 27–28 May 1905 and the annihilation of the Russian fleet by the Japanese, that Nicholas finally decided to sue for peace. Nicholas II accepted American mediation, appointing Sergei Witte chief plenipotentiary for the peace talks. The war was ended by the signing of the Treaty of Portsmouth. The Kishinev newspaper Bessarabets, which published anti-Semitic materials, received funds from Viacheslav Plehve, Minister of the Interior. These publications served to fuel the Kishinev pogrom (rioting). The government of Nicholas II formally condemned the rioting and dismissed the regional governor, with the perpetrators arrested and punished by the court. Leadership of the Russian Orthodox Church also condemned anti-Semitic pogroms. Appeals to the faithful condemning the pogroms were read publicly in all churches of Russia. In private Nicholas expressed his admiration for the mobs, viewing anti-Semitism as a useful tool for unifying the people behind the government; however in 1911, following the assassination of Pyotr Stolypin by the Jewish revolutionary Dmitry Bogrov, he approved of government efforts to prevent anti-Semitic pogroms. A few days prior to Bloody Sunday (9 (22) January 1905), priest and labor leader Georgy Gapon informed the government of the forthcoming procession to the Winter Palace to hand a workers' petition to the Tsar. On Saturday, 8 (21) January, the ministers convened to consider the situation. There was never any thought that the Tsar, who had left the capital for Tsarskoye Selo on the advice of the ministers, would actually meet Gapon; the suggestion that some other member of the imperial family receive the petition was rejected. Finally informed by the Prefect of Police that he lacked the men to pluck Gapon from among his followers and place him under arrest, the newly appointed Minister of the Interior, Prince Sviatopolk-Mirsky, and his colleagues decided to bring additional troops to reinforce the city. That evening Nicholas wrote in his diary, "Troops have been brought from the outskirts to reinforce the garrison. Up to now the workers have been calm. Their number is estimated at 120,000. At the head of their union is a kind of socialist priest named Gapon. Mirsky came this evening to present his report on the measures taken." On Sunday, 9 (22) January 1905, Gapon began his march. Locking arms, the workers marched peacefully through the streets. Some carried religious icons and banners, as well as national flags and portraits of the Tsar. As they walked, they sang hymns and God Save The Tsar. At 2 pm all of the converging processions were scheduled to arrive at the Winter Palace. There was no single confrontation with the troops. Throughout the city, at bridges on strategic boulevards, the marchers found their way blocked by lines of infantry, backed by Cossacks and Hussars; and the soldiers opened fire on the crowd. The official number of victims was 92 dead and several hundred wounded. Gapon vanished and the other leaders of the march were seized. Expelled from the capital, they circulated through the empire, increasing the casualties. As bullets riddled their icons, their banners and their portraits of Nicholas, the people shrieked, "The Tsar will not help us!" Outside Russia, the future British Labour Prime Minister Ramsay MacDonald attacked the Tsar, calling him a "blood-stained creature and a common murderer". Difficult day! In St. Petersburg there were serious disturbances due to the desire of workers to get to the Winter Palace. The troops had to shoot in different places of the city, there were many dead and wounded. Lord, how painful and bad! Nicky had the police report a few days before. That Saturday he telephoned my mother at the Anitchkov and said that she and I were to leave for Gatchina at once. He and Alicky went to Tsarskoye Selo. Insofar as I remember, my Uncles Vladimir and Nicholas were the only members of the family left in St. Petersburg, but there may have been others. I felt at the time that all those arrangements were hideously wrong. Nicky's ministers and the Chief of Police had it all their way. My mother and I wanted him to stay in St. Petersburg and to face the crowd. I am positive that, for all the ugly mood of some of the workmen, Nicky's appearance would have calmed them. They would have presented their petition and gone back to their homes. But that wretched Epiphany incident had left all the senior officials in a state of panic. They kept on telling Nicky that he had no right to run such a risk, that he owed it to the country to leave the capital, that even with the utmost precautions taken there might always be some loophole left. My mother and I did all we could to persuade him that the ministers' advice was wrong, but Nicky preferred to follow it and he was the first to repent when he heard of the tragic outcome. From his hiding place Gapon issued a letter, stating "Nicholas Romanov, formerly Tsar and at present soul-murderer of the Russian empire. The innocent blood of workers, their wives and children lies forever between you and the Russian people ... May all the blood which must be spilled fall upon you, you Hangman. I call upon all the socialist parties of Russia to come to an immediate agreement among themselves and bring an armed uprising against Tsarism." Confronted with growing opposition and after consulting with Witte and Prince Sviatopolk-Mirsky, the Tsar issued a reform ukase on 25 December 1904 with vague promises. In hopes of cutting short the rebellion, many demonstrators were shot on Bloody Sunday (1905) as they tried to march to the Winter Palace in St. Petersburg. Dmitri Feodorovich Trepov was ordered to take drastic measures to stop the revolutionary activity. Grand Duke Sergei was killed in February by a revolutionary's bomb in Moscow as he left the Kremlin. On 3 March the Tsar condemned the revolutionaries. Meanwhile, Witte recommended that a manifesto be issued. Schemes of reform would be elaborated by Goremykin and a committee consisting of elected representatives of the zemstvos and municipal councils under the presidency of Witte. In June the battleship Potemkin, part of the Black Sea Fleet, mutinied. It makes me sick to read the news! Nothing but strikes in schools and factories, murdered policemen, Cossacks and soldiers, riots, disorder, mutinies. But the ministers, instead of acting with quick decision, only assemble in council like a lot of frightened hens and cackle about providing united ministerial action... ominous quiet days began, quiet indeed because there was complete order in the streets, but at the same time everybody knew that something was going to happen — the troops were waiting for the signal, but the other side would not begin. One had the same feeling, as before a thunderstorm in summer! Everybody was on edge and extremely nervous and of course, that sort of strain could not go on for long.... We are in the midst of a revolution with an administrative apparatus entirely disorganized, and in this lies the main danger. In October a railway strike developed into a general strike which paralysed the country. In a city without electricity, Witte told Nicholas II "that the country was at the verge of a cataclysmic revolution". According to Orlando Figes the Tsar asked his uncle Grand Duke Nicholas to assume the role of dictator. "But the Grand Duke ... took out a revolver and threatened to shoot himself there and then if the Tsar refused to endorse Witte's memorandum." Nicholas II had no choice but to make a number of steps in the constitutional liberal direction. The Tsar accepted the draft, hurriedly outlined by Aleksei D. Obolensky. The Emperor and Autocrat of All the Russias was forced to sign the October Manifesto agreeing to the establishment of the Imperial Duma, and to give up part of his unlimited autocracy. For the next six months, Witte was the Prime Minister. According to Harold Williams: "That government was almost paralyzed from the beginning." On 26 October (O.S.) the Tsar appointed Trepov Master of the Palace (without consulting Witte), and had daily contact with the Emperor; his influence at court was paramount. On 1 November 1905 (O.S. ), Princess Milica of Montenegro presented Grigori Rasputin to Tsar Nicholas and his wife (who by then had a hemophiliac son) at Peterhof Palace. B[ozheyu] M[ilostyu] Nikolay Imperator i Samoderzhets Vse[ya] Ross[ii].[iyskiy]. The English translation is, "By the grace of God, Nicholas II, Emperor and Autocrat of All the Russias." Under pressure from the attempted 1905 Russian Revolution, on 5 August of that year Nicholas II issued a manifesto about the convocation of the State Duma, known as the Bulygin Duma, initially thought to be an advisory organ. In the October Manifesto, the Tsar pledged to introduce basic civil liberties, provide for broad participation in the State Duma, and endow the Duma with legislative and oversight powers. He was determined, however, to preserve his autocracy even in the context of reform. This was signalled in the text of the 1906 constitution. He was described as the supreme autocrat, and retained sweeping executive powers, also in church affairs. His cabinet ministers were not allowed to interfere or assist each other; they were responsible only to him. There was such gloom at Tsarskoye Selo. I did not understand anything about politics. I just felt everything was going wrong with the country and all of us. The October Constitution did not seem to satisfy anyone. I went with my mother to the first Duma. I remember the large group of deputies from among peasants and factory people. The peasants looked sullen. But the workmen were worse: they looked as though they hated us. I remember the distress in Alicky's eyes. Minister of the Court Count Vladimir Frederiks commented, "The Deputies, they give one the impression of a gang of criminals who are only waiting for the signal to throw themselves upon the ministers and cut their throats. I will never again set foot among those people." The Dowager Empress noticed "incomprehensible hatred." Although Nicholas initially had a good relationship with his prime minister, Sergei Witte, Alexandra distrusted him as he had instigated an investigation of Grigori Rasputin and, as the political situation deteriorated, Nicholas dissolved the Duma. The Duma was populated with radicals, many of whom wished to push through legislation that would abolish private property ownership, among other things. Witte, unable to grasp the seemingly insurmountable problems of reforming Russia and the monarchy, wrote to Nicholas on 14 April 1906 resigning his office (however, other accounts have said that Witte was forced to resign by the Emperor). 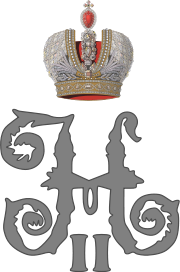 Nicholas was not ungracious to Witte and an Imperial Rescript was published on 22 April creating Witte a Knight of the Order of Saint Alexander Nevsky with diamonds (the last two words were written in the Emperor's own hand, followed by "I remain unalterably well-disposed to you and sincerely grateful, for ever more Nicholas."). A grotesque deputation is coming from England to see liberal members of the Duma. Uncle Bertie informed us that they were very sorry but were unable to take action to stop their coming. Their famous "liberty", of course. How angry they would be if a deputation went from us to the Irish to wish them success in their struggle against their government. All would be well if everything said in the Duma remained within its walls. Every word spoken, however, comes out in the next day's papers which are avidly read by everyone. In many places the populace is getting restive again. They begin to talk about land once more and are waiting to see what the Duma is going to say on the question. I am getting telegrams from everywhere, petitioning me to order a dissolution, but it is too early for that. One has to let them do something manifestly stupid or mean and then — slap! And they are gone! After the Second Duma resulted in similar problems, the new prime minister Pyotr Stolypin (whom Witte described as "reactionary") unilaterally dissolved it, and changed the electoral laws to allow for future Dumas to have a more conservative content, and to be dominated by the liberal-conservative Octobrist Party of Alexander Guchkov. Stolypin, a skilful politician, had ambitious plans for reform. These included making loans available to the lower classes to enable them to buy land, with the intent of forming a farming class loyal to the crown. Nevertheless, when the Duma remained hostile, Stolypin had no qualms about invoking Article 87 of the Fundamental Laws, which empowered the Tsar to issue 'urgent and extraordinary' emergency decrees 'during the recess of the State Duma'. Stolypin's most famous legislative act, the change in peasant land tenure, was promulgated under Article 87. The third Duma remained an independent body. This time the members proceeded cautiously. Instead of hurling themselves at the government, opposing parties within the Duma worked to develop the body as a whole. In the classic manner of the British Parliament, the Duma reached for power grasping for the national purse strings. The Duma had the right to question ministers behind closed doors as to their proposed expenditures. These sessions, endorsed by Stolypin, were educational for both sides, and, in time, mutual antagonism was replaced by mutual respect. Even the sensitive area of military expenditure, where the October Manifesto clearly had reserved decisions to the throne, a Duma commission began to operate. Composed of aggressive patriots no less anxious than Nicholas to restore the fallen honour of Russian arms, the Duma commission frequently recommended expenditures even larger than those proposed. With the passage of time, Nicholas also began to have confidence in the Duma. "This Duma cannot be reproached with an attempt to seize power and there is no need at all to quarrel with it," he said to Stolypin in 1909. Nevertheless, Stolypin's plans were undercut by conservatives at court. Reactionaries such as Prince Vladimir Nikolayevich Orlov never tired of telling the Tsar that the very existence of the Duma was a blot on the autocracy, which Tsaritsa Alexandra had always believed anyway. Stolypin, they whispered, was a traitor and secret revolutionary who was conniving with the Duma to steal the prerogatives assigned the Tsar by God. Witte also engaged in constant intrigue against Stolypin. Although Stolypin had had nothing to do with Witte's fall, Witte blamed him. Stolypin had unwittingly angered the Tsaritsa. He had ordered an investigation into Rasputin and presented it to the Tsar, who read it but did nothing. Stolypin, on his own authority, ordered Rasputin to leave St. Petersburg. Alexandra protested vehemently but Nicholas refused to overrule his Prime Minister, who had more influence with the Emperor. Despite most convincing arguments in favour of adopting a positive decision in this matter, an inner voice keeps on insisting more and more that I do not accept responsibility for it. So far my conscience has not deceived me. Therefore I intend in this case to follow its dictates. I know that you, too, believe that "a Tsar's heart is in God's hands." Let it be so. For all laws established by me I bear a great responsibility before God, and I am ready to answer for my decision at any time. Alexandra, believing that Stolypin had severed the bonds that her son depended on for life, hated the Prime Minister. In March 1911, in a fit of anger stating that he no longer commanded the imperial confidence, Stolypin asked to be relieved of his office. Two years earlier when Stolypin had casually mentioned resigning to Nicholas he was informed: "This is not a question of confidence or lack of it. It is my will. Remember that we live in Russia, not abroad...and therefore I shall not consider the possibility of any resignation." It never got that far. On 18 September 1911, in a procession where Stolypin's car was unprotected, Rasputin had coincidentally returned from his exile. As Stolypin's car passed him, Rasputin cried out in a loud voice, "Death is after him! Death is driving behind him!" Bogrov would later assassinate Stolypin in the Kiev theatre that night. In 1912, a fourth Duma was elected with almost the same membership as the third. "The Duma started too fast. Now it is slower, but better, and more lasting," stated Nicholas to Sir Bernard Pares. The First World War developed badly for Russia. By late 1916, Romanov family desperation reached the point that Grand Duke Paul Alexandrovich, younger brother of Alexander III and the Tsar's only surviving uncle, was deputed to beg Nicholas to grant a constitution and a government responsible to the Duma. Nicholas sternly and adamantly refused, reproaching his uncle for asking him to break his coronation oath to maintain autocratic power for his successors. In the Duma on 2 December 1916, Vladimir Purishkevich, a fervent patriot, monarchist and war worker, denounced the dark forces which surrounded the throne in a thunderous two-hour speech which was tumultuously applauded. "Revolution threatens," he warned, "and an obscure peasant shall govern Russia no longer!" Further complicating domestic matters was the matter of the succession. Alexandra bore Nicholas four daughters, the Grand Duchess Olga in 1895, the Grand Duchess Tatiana in 1897, Grand Duchess Maria in 1899, and Grand Duchess Anastasia in 1901, before their son Alexei was born on 12 August 1904. The young heir was afflicted with Haemophilia B, a hereditary disease that prevents blood from clotting properly, which at that time was untreatable and usually led to an untimely death. As a granddaughter of Queen Victoria, Alexandra carried the same gene mutation that afflicted several of the major European royal houses, such as Prussia and Spain. Hemophilia therefore became known as "the royal disease". Through Alexandra the disease had passed on to her son. As all of Nicholas and Alexandra's daughters perished with their parents and brother in Yekaterinburg in 1918, it is not known whether any of them inherited the gene as carriers. Because of the fragility of the autocracy at this time, Nicholas and Alexandra chose not to divulge Alexei's condition to anyone outside the imperial household. In fact, there were many in the household who were unaware of the exact nature of the Tsarevich's illness. At first Alexandra turned to Russian doctors and medics to treat Alexei; however, their treatments generally failed, and Alexandra increasingly turned to mystics and holy men (or starets as they were called in Russian). One of these starets, an illiterate Siberian named Grigori Rasputin, appeared to have some success. Rasputin's influence over Empress Alexandra, and consequently the Tsar himself, had grown stronger ever since 1912, when the Tsarevich nearly died from an injury while the family was on vacation at the hunting lodges at Białowieża and Spała (Poland). 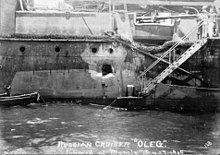 The bleeding grew steadily worse until it was assumed that the Tsarevich would not survive, and the Last Sacrament was administered on 10 October 1912. In desperation Alexandra called upon Rasputin as a last resort, to which he replied, "God has seen your tears and heard your prayers. Do not grieve. The Little One will not die. Do not allow the doctors to bother him too much." The haemorrhage stopped the very next day and the boy began to recover. Alexandra took this as a sign that Rasputin was a starets and that God was with him; for the rest of her life she would fervently defend him and turn her wrath against anyone who dared to question him. In 1907, to end longstanding controversies over central Asia, Russia and Great Britain signed the Anglo-Russian Convention that resolved most of the problems generated for decades by The Great Game. Great Britain had already entered into the Entente cordiale with France in 1904, and the Anglo-Russian convention led to the formation of the Triple Entente. The following year, in May 1908, Nicholas and Alexandra's shared "Uncle Bertie" and "Aunt Alix," Britain's King Edward VII and Queen Alexandra, made a state visit to Russia, being the first reigning British monarchs to do so. However, they did not set foot on Russian soil. Instead, they stayed aboard their yachts, meeting off the coast of modern-day Tallinn. Later that year, Nicholas was taken off guard by the news that his foreign minister, Alexander Izvolsky, had entered into a secret agreement with the Austro-Hungarian foreign minister, Count Alois von Aehrenthal, agreeing that, in exchange for Russian naval access to the Dardanelles and the Bosporus Strait, Russia would not oppose the Austrian annexation of Bosnia and Herzegovina, a revision of the 1878 Treaty of Berlin. When Austria-Hungary did annex this territory that October, it precipitated the diplomatic crisis. When Russia protested about the annexation, the Austrians threatened to leak secret communications between Izvolsky and Aehernthal, prompting Nicholas to complain in a letter to the Austrian emperor, Franz Joseph, about a breach of confidence. In 1909, in the wake of the Anglo-Russian convention, the Russian imperial family made a visit to England, staying on the Isle of Wight for Cowes Week. In 1913, during the Balkan Wars, Nicholas personally offered to arbitrate between Serbia and Bulgaria. However, the Bulgarians rejected his offer. Also in 1913, Nicholas, albeit without Alexandra, made a visit to Berlin for the wedding of Kaiser Wilhelm II's daughter, Princess Victoria Louise, to a maternal cousin of Nicholas, Ernest Augustus, the Duke of Brunswick. Nicholas was also joined by his cousin, King George V and his wife, Queen Mary. In February 1913, Nicholas presided over the tercentenary celebrations for the Romanov Dynasty. On 21 February, a Te Deum took place at Kazan Cathedral, and a state reception at the Winter Palace. In May, Nicholas and the imperial family made a pilgrimage across the empire, retracing the route down the Volga River that was made by the teenage Michael Romanov from the Ipatiev Monastery in Kostroma to Moscow in 1613 when he finally agreed to become tsar. On 28 June 1914 Archduke Franz Ferdinand of Austria, heir to the Austro-Hungarian throne, was assassinated by a Bosnian Serb nationalist in Sarajevo. The outbreak of war was not inevitable, but leaders, diplomats and nineteenth-century alliances created a climate for large-scale conflict. The concept of Pan-Slavism and shared ethnicity and religion created strong public sympathy between Russia and Serbia. Territorial conflict created rivalries between Germany and France and between Austria-Hungary and Serbia, and as a consequence alliance networks developed across Europe. The Triple Entente and Triple Alliance networks were set before the war. Nicholas wanted neither to abandon Serbia to the ultimatum of Austria, nor to provoke a general war. In a series of letters exchanged with Wilhelm of Germany (the "Willy and Nicky correspondence") the two proclaimed their desire for peace, and each attempted to get the other to back down. Nicholas desired that Russia's mobilization be only against Austria-Hungary, in the hopes of preventing war with Germany. 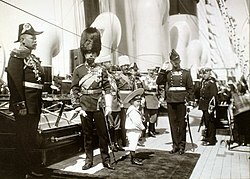 Nicholas II (right) with Kaiser Wilhelm II of Germany in 1905. Nicholas is wearing a German Army uniform, while Wilhelm wears that of a Russian hussar regiment. On 25 July 1914, at his council of ministers, Nicholas decided to intervene in the Austro-Serbian conflict, a step toward general war. He put the Russian army on "alert" on 25 July. Although this was not general mobilization, it threatened the German and Austro-Hungarian borders and looked like military preparation for war. However, his army had no contingency plans for a partial mobilization, and on 30 July 1914 Nicholas took the fateful step of confirming the order for general mobilization, despite being strongly counselled against it. On 28 July, Austria-Hungary formally declared war against Serbia. On 29 July 1914, Nicholas sent a telegram to Wilhelm with the suggestion to submit the Austro-Serbian problem to the Hague Conference (in Hague tribunal). Wilhelm did not address the question of the Hague Conference in his subsequent reply. Count Witte told the French Ambassador, Maurice Paléologue that from Russia's point of view the war was madness, Slav solidarity was simply nonsense and Russia could hope for nothing from the war. On 30 July, Russia ordered general mobilization, but still maintained that it would not attack if peace talks were to begin. Germany, reacting to the discovery of partial mobilization ordered on 25 July, announced its own pre-mobilization posture, the Imminent Danger of War. Germany requested that Russia demobilize within the next twelve hours. In Saint Petersburg, at 7pm, with the ultimatum to Russia having expired, the German ambassador to Russia met with the Russian Foreign Minister Sergey Sazonov, asked three times if Russia would reconsider, and then with shaking hands, delivered the note accepting Russia's war challenge and declaring war on 1 August. Less than a week later, on 6 August, Franz Joseph signed the Austro-Hungarian declaration of war on Russia. The outbreak of war on 1 August 1914 found Russia grossly unprepared. Russia and her allies placed their faith in her army, the famous 'Russian steamroller'. Its pre-war regular strength was 1,400,000; mobilization added 3,100,000 reserves and millions more stood ready behind them. In every other respect, however, Russia was unprepared for war. Germany had ten times as much railway track per square mile, and whereas Russian soldiers travelled an average of 1,290 kilometres (800 mi) to reach the front, German soldiers traveled less than a quarter of that distance. Russian heavy industry was still too small to equip the massive armies the Tsar could raise, and her reserves of munitions were pitifully small; while the German army in 1914 was better equipped than any other, man-for-man, the Russians were severely short on artillery pieces, shells, motorized transports, and even boots. With the Baltic Sea barred by German U-boats and the Dardanelles by the guns of Germany's ally, the Ottoman Empire, Russia initially could receive help only via Archangel, which was frozen solid in winter, or via Vladivostok, which was over 6,400 kilometres (4,000 mi) from the front line. By 1915, a rail line was built north from Petrozavodsk to the Kola Gulf and this connection laid the foundation of the ice-free port of what eventually was called Murmansk. The Russian High Command was moreover greatly weakened by the mutual contempt between Vladimir Sukhomlinov, the Minister of War, and the redoubtable warrior giant Grand Duke Nicholas Nikolayevich who commanded the armies in the field. In spite of all of this, an immediate attack was ordered against the German province of East Prussia. The Germans mobilised there with great efficiency and completely defeated the two Russian armies which had invaded. The Battle of Tannenberg, where an entire Russian army was annihilated, cast an ominous shadow over Russia's future. Russia had great success against both the Austro-Hungarian and Ottoman armies from the very beginning of the war, but they never succeeded against the might of the German Army. In September 1914, in order to relieve pressure on France, the Russians were forced to halt a successful offensive against Austria-Hungary in Galicia in order to attack German-held Silesia. Gradually a war of attrition set in on the vast Eastern Front, where the Russians were facing the combined forces of the German and Austro-Hungarian armies, and they suffered staggering losses. General Denikin, retreating from Galicia wrote, "The German heavy artillery swept away whole lines of trenches, and their defenders with them. We hardly replied. There was nothing with which we could reply. Our regiments, although completely exhausted, were beating off one attack after another by bayonet ... Blood flowed unendingly, the ranks became thinner and thinner and thinner. The number of graves multiplied." On 5 August, with the Russian army in retreat, Warsaw fell. Defeat at the front bred disorder at home. At first, the targets were German, and for three days in June shops, bakeries, factories, private houses and country estates belonging to people with German names were looted and burned.. The inflamed mobs then turned on the government, declaring the Empress should be shut up in a convent, the Tsar deposed and Rasputin hanged. Nicholas was by no means deaf to these discontents. An emergency session of the Duma was summoned and a Special Defense Council established, its members drawn from the Duma and the Tsar's ministers. In July 1915, King Christian X of Denmark, first cousin of the Tsar, sent Hans Niels Andersen to Tsarskoye Selo with an offer to act as a mediator. He made several trips between London, Berlin and Petrograd and in July saw the Dowager Empress Maria Fyodorovna. Andersen told her they should conclude peace. Nicholas chose to turn down King Christian's offer of mediation, as he felt it would be a betrayal for Russia to form a separate peace treaty with the Central Powers when its allies Britain and France were still fighting. The energetic and efficient General Alexei Polivanov replaced Sukhomlinov as Minister of War, which failed to improve the strategic situation. In the aftermath of the Great Retreat and the loss of the Kingdom of Poland, Nicholas assumed the role of commander-in-chief after dismissing his cousin, Nikolay Nikolayevich, in September 1915. This was a mistake, as the Tsar came to be personally associated with the continuing losses at the front. He was also away at the remote HQ at Mogilev, far from the direct governance of the empire, and when revolution broke out in Petrograd he was unable to halt it. In reality the move was largely symbolic, since all important military decisions were made by his chief-of-staff General Michael Alexeiev, and Nicholas did little more than review troops, inspect field hospitals, and preside over military luncheons. The Duma was still calling for political reforms and political unrest continued throughout the war. Cut off from public opinion, Nicholas could not see that the dynasty was tottering. With Nicholas at the front, domestic issues and control of the capital were left with his wife Alexandra. However, Alexandra's relationship with Grigori Rasputin, and her German background, further discredited the dynasty's authority. Nicholas had been repeatedly warned about the destructive influence of Rasputin but had failed to remove him. Rumors and accusations about Alexandra and Rasputin appeared one after another; Alexandra was even accused of harboring treasonous sympathies towards Germany. Anger at Nicholas's failure to act and the extreme damage that Rasputin's influence was doing to Russia's war effort and to the monarchy led to Rasputin's eventual murder by a group of nobles, led by Prince Felix Yusupov and Grand Duke Dmitri Pavlovich, a cousin of the Tsar, in the early morning of Saturday 17 December 1916 (O.S.) / 30 December 1916 (N.S.). As the government failed to produce supplies, mounting hardship created massive riots and rebellions. With Nicholas away at the front from 1915 through 1916, authority appeared to collapse and the capital was left in the hands of strikers and mutineering conscript soldiers. Despite efforts by the British Ambassador Sir George Buchanan to warn the Tsar that he should grant constitutional reforms to fend off revolution, Nicholas continued to bury himself away at the Staff HQ (Stavka) 600 kilometres (400 mi) away at Moghilev, leaving his capital and court open to intrigues and insurrection. By early 1917, Russia was on the verge of total and utter collapse. The army had taken 15 million men from the farms and food prices had soared. An egg cost four times what it had in 1914, butter five times as much. The severe winter dealt the railways, overburdened by emergency shipments of coal and supplies, the final blow. Russia began the war with 20,000 locomotives; by 1917, 9,000 were in service, while the number of serviceable railway wagons had dwindled from half a million to 170,000. In February 1917, 1,200 locomotives burst their boilers and nearly 60,000 wagons were immobilised. In Petrograd, supplies of flour and fuel had all but disappeared. War-time prohibition of alcohol was enacted by Nicholas to boost patriotism and productivity, but instead damaged the treasury and funding of the war due to the treasury now being deprived of alcohol taxes. On 23 February 1917 in Petrograd, a combination of very severe cold weather and acute food shortages caused people to start to break shop windows to get bread and other necessities. In the streets, red banners appeared and the crowds chanted "Down with the German woman! Down with Protopopov! Down with the war! Down with the Tsar!" Police started to shoot at the populace from rooftops, which incited riots. The troops in the capital were poorly motivated and their officers had no reason to be loyal to the regime. They were angry and full of revolutionary fervor and sided with the populace. The Tsar's Cabinet begged Nicholas to return to the capital and offered to resign completely. The Tsar, 800 kilometres (500 mi) away, was misinformed by the Minister of the Interior, Alexander Protopopov, that the situation was under control, and he ordered that firm steps be taken against the demonstrators. For this task, the Petrograd garrison was quite unsuitable. The cream of the old regular army had been destroyed in Poland and Galicia. In Petrograd, 170,000 recruits, country boys or older men from the working-class suburbs of the capital itself, remained to keep control under the command of wounded officers invalided from the front and cadets from the military academies. The units in the capital, although many bore the names of famous Imperial Guard regiments, were in reality rear or reserve battalions of these regiments, the regular units being away at the front. Many units, lacking both officers and rifles, had never undergone formal training. General Khabalov attempted to put the Tsar's instructions into effect on the morning of Sunday, 11 March 1917. Despite huge posters ordering people to keep off the streets, vast crowds gathered and were only dispersed after some 200 had been shot dead, though a company of the Volinsky Regiment fired into the air rather than into the mob, and a company of the Pavlovsky Life Guards shot the officer who gave the command to open fire. Nicholas, informed of the situation by Rodzianko, ordered reinforcements to the capital and suspended the Duma. However, it was too late. On 12 March, the Volinsky Regiment mutinied and was quickly followed by the Semenovsky, the Ismailovsky, the Litovsky Life Guards and even the legendary Preobrazhensky Regiment of the Imperial Guard, the oldest and staunchest regiment founded by Peter the Great. The arsenal was pillaged, the Ministry of the Interior, Military Government building, police headquarters, the Law Courts and a score of police buildings were put to the torch. By noon, the fortress of Peter and Paul, with its heavy artillery, was in the hands of the insurgents. By nightfall, 60,000 soldiers had joined the revolution. Order broke down and members of the Duma and the Soviet formed a Provisional Government to try to restore order. They issued a demand that Nicholas must abdicate. Faced with this demand, which was echoed by his generals, deprived of loyal troops, with his family firmly in the hands of the Provisional Government and fearful of unleashing civil war and opening the way for German conquest, Nicholas had little choice but to submit. In the days of the great struggle against the foreign enemies, who for nearly three years have tried to enslave our fatherland, the Lord God has been pleased to send down on Russia a new heavy trial. Internal popular disturbances threaten to have a disastrous effect on the future conduct of this persistent war. The destiny of Russia, the honor of our heroic army, the welfare of the people and the whole future of our dear fatherland demand that the war should be brought to a victorious conclusion whatever the cost. The cruel enemy is making his last efforts, and already the hour approaches when our glorious army together with our gallant allies will crush him. In these decisive days in the life of Russia, We thought it Our duty of conscience to facilitate for Our people the closest union possible and a consolidation of all national forces for the speedy attainment of victory. In agreement with the Imperial Duma We have thought it well to renounce the Throne of the Russian Empire and to lay down the supreme power. As We do not wish to part from Our beloved son, We transmit the succession to Our brother, the Grand Duke Michael Alexandrovich, and give Him Our blessing to mount the Throne of the Russian Empire. We direct Our brother to conduct the affairs of state in full and inviolable union with the representatives of the people in the legislative bodies on those principles which will be established by them, and on which He will take an inviolable oath. In the name of Our dearly beloved homeland, We call on Our faithful sons of the fatherland to fulfill their sacred duty to the fatherland, to obey the Tsar in the heavy moment of national trials, and to help Him, together with the representatives of the people, to guide the Russian Empire on the road to victory, welfare, and glory. May the Lord God help Russia! Grand Duke Michael was proclaimed as "Emperor Michael II" to Russian troops and in cities throughout Russia, but his accession was not universally welcomed. While some units cheered and swore allegiance to the new Emperor, others remained indifferent. He subsequently declined to accept the throne until the people were allowed to vote through a Constituent Assembly for the continuance of the monarchy or a republic. The abdication of Nicholas II and Michael's deferment of accepting the throne brought three centuries of the Romanov dynasty's rule to an end. The fall of autocratic Tsardom brought joy to Liberals and Socialists in Britain and France. The United States of America was the first foreign government to recognize the Provisional government. In Russia, the announcement of the Tsar's abdication was greeted with many emotions, including delight, relief, fear, anger and confusion. Nicholas desperately wanted to go into exile in the United Kingdom following his abdication. The British government reluctantly offered the family asylum in the UK on 19 March 1917, although it was suggested that it would be better for the Romanovs to go to a neutral country. News of the offer provoked uproar from the Labour Party and many Liberals, and the British ambassador Sir George Buchanan advised the government that the extreme left would use the ex-Tsar's presence "as an excuse for rousing public opinion against us". The offer of asylum was withdrawn in April following objections by King George V, who, acting on the advice of his secretary Arthur Bigge, 1st Baron Stamfordham, was worried that Nicholas's presence in the UK might provoke an uprising like the previous year's Easter Rising in Ireland. The French government declined to accept the Romanovs in view of increasing unrest on the Western Front and on the home front as a result of the ongoing war with Germany. The British ambassador in Paris, Lord Francis Bertie, advised the Foreign Secretary that the Romanovs would be unwelcome in France as the ex-Empress was regarded as pro-German. In the early summer of 1917, after an improvement in the internal political situation in Russia, the Russian government approached the UK government on the issue of asylum and was informed the offer had been withdrawn due to the considerations of British internal politics. In August, the Kerensky government evacuated the Romanovs to Tobolsk in the Urals as a winter refuge to protect them from the rising tide of revolution, until the family could be sent abroad in the spring of 1918 via Japan. There they lived in the former Governor's Mansion in considerable comfort. In October 1917, however, the Bolsheviks seized power from Kerensky's Provisional Government; Nicholas followed the events in October with interest but not yet with alarm. Boris Soloviev, the husband of Maria Rasputin, was supposedly organizing rescue attempts with monarchical factions, but none occurred. Rumors persist that Soloviev was working for the Bolsheviks or the Germans, or both. Nicholas continued to underestimate Lenin's importance. In the meantime he and his family occupied themselves with keeping warm. Conditions of imprisonment became more strict, and talk of putting Nicholas on trial grew more frequent. The Tsar was forbidden to wear epaulettes. On 1 March 1918, the family was placed on soldier's rations, which meant parting with ten devoted servants and giving up butter and coffee as luxuries. Nicholas and Alexandra were appalled by news of the Treaty of Brest-Litovsk, whereby Russia agreed to give up Poland, Finland, the Baltic States, the Ukraine, the Crimea and most of the Caucasus. What kept the family's spirits up was the belief that help was at hand. The Romanovs believed that various plots were underway to break them out of captivity and smuggle them to safety. The Western Allies lost interest in the fate of the Romanovs after Russia left the war. The German government wanted the monarchy restored in Russia to crush the Bolsheviks and maintain good relations with the Central Powers. 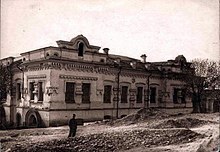 But on 30 April 1918 the Romanovs were transferred to their final destination: the town of Yekaterinburg, where they were imprisoned in the two-storey Ipatiev House, the home of the military engineer Nikolay Nikolayevich Ipatiev, which ominously became referred to as the "house of special purpose". There are several accounts of what happened and historians have not agreed on a solid, confirmed scope of events. According to the account of Yurovsky (the chief executioner), in the early hours of 17 July 1918, the royal family was awakened around 2:00 am, got dressed, and were led down into a half-basement room at the back of the Ipatiev house. The pretext for this move was the family's safety, i.e. that anti-Bolshevik forces were approaching Yekaterinburg, and the house might be fired upon. Present with Nicholas, Alexandra and their children were their doctor and three of their servants, who had voluntarily chosen to remain with the family: the Tsar's personal physician Eugene Botkin, his wife's maid Anna Demidova, and the family's chef, Ivan Kharitonov, and footman, Alexei Trupp. A firing squad had been assembled and was waiting in an adjoining room, composed of seven Communist soldiers from Central Europe, and three local Bolsheviks, all under the command of Bolshevik officer Yakov Yurovsky. Nicholas was carrying his son. When the family arrived in the basement, the former empress complained that there were no chairs for them to sit on. Yurovsky ordered two chairs brought in, and when the empress and the heir were seated, the executioners filed into the room. Yurovsky announced to them that the Ural Soviet of Workers' Deputies had decided to execute them. A stunned Nicholas asked, "What? What?" and turned toward his family. Yurovsky quickly repeated the order and Nicholas said, according to Peter Ermakov, "You know not what you do." The executioners drew handguns and began shooting; Nicholas was the first to die. Yurovsky took credit afterwards for firing the first shot that killed the Tsar, but his protege – Grigory Nikulin – said years later that Mikhail Medvedev had fired the shot that killed Nicholas. "He fired the first shot. He killed the Tsar," he said in 1964 in a tape-recorded statement for the radio. Nicholas was shot several times in the chest (sometimes incorrectly said to have been shot in his head, but his skull bore no bullet wounds when it was discovered later). Anastasia, Tatiana, Olga, and Maria survived the first hail of bullets; the sisters were wearing over 1.3 kilograms of diamonds and precious gems sewn into their clothing, which provided some initial protection from the bullets and bayonets. First they were stabbed with bayonets and then shot at close range in their heads. An announcement from the Presidium of the Ural Regional Soviet of the Workers' and Peasants' Government emphasized that conspiracies had been exposed to free the ex-tsar, that counter-revolutionary forces were pressing in on Soviet Russian territory, and that the ex-tsar was guilty of unforgivable crimes against the nation. In view of the enemy's proximity to Yekaterinburg and the exposure by the Cheka of a serious White Guard plot with the goal of abducting the former Tsar and his family… In light of the approach of counterrevolutionary bands toward the Red capital of the Urals and the possibility of the crowned executioner escaping trial by the people (a plot among the White Guards to try to abduct him and his family was exposed and the compromising documents will be published), the Presidium of the Ural Regional Soviet, fulfilling the will of the Revolution, resolved to shoot the former Tsar, Nikolai Romanov, who is guilty of countless, bloody, violent acts against the Russian people. In 1979, the bodies of Tsar Nicholas II, Tsaritsa Alexandra, three of their daughters, and those of four non-family members killed with them, were discovered near Sverdlovsk (Yekaterinburg) by amateur archaeologist Alexander Avdonin. 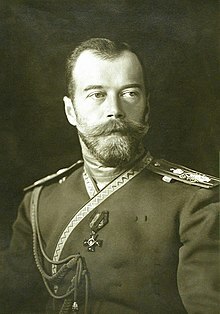 In January 1998, the remains excavated from underneath the dirt road near Yekaterinburg were officially identified as those of Nicholas II and his family, excluding one daughter (either Maria or Anastasia) and Alexei. The identifications—including comparisons to a living relative, were performed by separate Russian, British and American scientists using DNA analysis—concur and were found to be conclusive. In July 2007, an amateur historian discovered bones near Yekaterinburg belonging to a boy and young woman. Prosecutors reopened the investigation into the deaths of the imperial family, and in April 2008, DNA tests performed by an American laboratory proved that bone fragments exhumed in the Ural Mountains belonged to two children of Nicholas II, Alexei and a daughter. That same day it was announced by Russian authorities that remains from the entire family had been recovered. 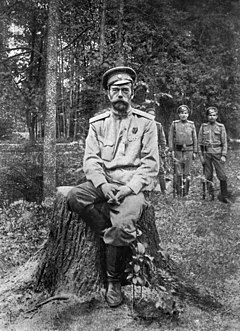 On 1 October 2008, Supreme Court of Russia ruled that Nicholas II and his family were victims of political persecution and should be rehabilitated. In March 2009, results of the DNA testing were published, confirming that the two bodies discovered in 2007 were those of Alexei and one of his sisters. In late 2015, at the insistence of the Russian Orthodox Church, Russian investigators exhumed the bodies of Nicholas II and his wife, Alexandra, for additional DNA testing, which confirmed that the bones were of the couple. After the DNA testing of 1998, the remains of the Emperor and his immediate family were interred at St. Peter and Paul Cathedral, Saint Petersburg, on 17 July 1998, on the eightieth anniversary of their executions. The ceremony was attended by Russian President Boris Yeltsin, who said, "Today is a historic day for Russia. For many years, we kept quiet about this monstrous crime, but the truth has to be spoken." The British Royal Family was represented at the funeral by Prince Michael of Kent, and more than twenty ambassadors to Russia, including Sir Andrew Wood, Archbishop John Bukovsky, and Ernst-Jörg von Studnitz, were also in attendance. In the last Orthodox Russian monarch and members of his family we see people who sincerely strove to incarnate in their lives the commands of the Gospel. In the suffering borne by the Royal Family in prison with humility, patience, and meekness, and in their martyrs' deaths in Yekaterinburg in the night of 17 July 1918 was revealed the light of the faith of Christ that conquers evil. However, Nicholas' canonization was controversial. The Russian Orthodox Church Abroad was split on the issue back in 1981, some members suggesting that the emperor was a weak ruler and had failed to thwart the rise of the Bolsheviks. It was pointed out by one priest that martyrdom in the Russian Orthodox Church has nothing to do with the martyr's personal actions but is instead related to why he or she was killed. The Russian Orthodox Church inside Russia rejected the family's classification as martyrs because they were not killed on account of their religious faith. Religious leaders in both churches also had objections to canonising the Tsar's family because they perceived him as a weak emperor whose incompetence led to the revolution and the suffering of his people and made him partially responsible for his own murder and those of his wife, children and servants. For these opponents, the fact that the Tsar was, in private life, a kind man and a good husband and father or a leader who showed genuine concern for the peasantry did not override his poor governance of Russia. Despite the original opposition, the Russian Orthodox Church inside Russia ultimately recognised the family as "passion bearers," or people who met their deaths with Christian humility. The contemporary assessments of Nicholas are remarkably uniform. He was described as shy, charming, gentle in disposition, fearful of controversy, indecisive, indulgent to his relatives, and deeply devoted to his family. Aleksandr Mosolov, who headed his Court Chancellery for sixteen years, wrote that Nicholas, though intelligent and well-educated, never adopted a definite, energetic attitude and loathed making a decision in the presence of others. Sergei Witte, who served Nicholas and his father for eleven years as Minister of Finance, commented that the Tsar was a well-intentioned child, but his actions were entirely dependent upon the character of his counselors, most of whom were bad. [The Russian Empire] was ruled from the top by a sovereign who had but one idea of government—to preserve intact the absolute monarchy bequeathed to him by his father—and who, lacking the intellect, energy or training for his job, fell back on personal favorites, whim, simple mulishness, and other devices of the empty-headed autocrat. His father, Alexander III, who deliberately intended to keep his son uneducated in statecraft until the age of thirty, unfortunately miscalculated his own life expectancy, and died when Nicholas was twenty-six. The new Tsar had learned nothing in the interval, and the impression of imperturbability he conveyed was in reality apathy—the indifference of a mind so shallow as to be all surface. When a telegram was brought to him announcing the annihilation of the Russian fleet at Tsushima, he read it, stuffed it in his pocket, and went on playing tennis. In Russia, Nicholas II faced widespread criticism after the victory of the Revolution. Pavel Bykov, who in Russia wrote the first full account about the downfall of the Tsar, denounced Nicholas as a "tyrant, who paid with his life for the age-old repression and arbitrary rule of his ancestors over the Russian people, over the impoverished and blood-soaked country". Soviet-era historians noted that Nicholas II was not fit to be a statesman. It has been argued that he had a weak will and was manipulated by adventurist forces. His regime was condemned for extensive use of the army, police, and courts to destroy the revolutionary movement. He was criticised for fanning nationalism and chauvinism. With the punitive expeditions and courts-martial during the 1905 Revolution, the monarch became known as "Nicholas the Bloody". Nicholas's reign was seen as a time of suffering for Russians. ... there still are those who for political or other reasons continue to insist that Nicholas was "Bloody Nicholas". Most commonly, he is described as shallow, weak, stupid—a one-dimensional figure presiding feebly over the last days of a corrupt and crumbling system. This, certainly, is the prevailing public image of the last Tsar. Historians admit that Nicholas was a "good man"—the historical evidence of personal charm, gentleness, love of family, deep religious faith and strong Russian patriotism is too overwhelming to be denied—but they argue that personal factors are irrelevant; what matters is that Nicholas was a bad tsar .... Essentially, the tragedy of Nicholas II was that he appeared in the wrong place in history. Nicholas II's full title as Emperor, as set forth in Article 59 of the 1906 Constitution, was: "By the Grace of God, We Nicholas, Emperor and Autocrat of All the Russias, of Moscow, Kiev, Vladimir, Novgorod; Tsar of Kazan, Tsar of Astrakhan, Tsar of Poland, Tsar of Siberia, Tsar of Tauric Chersonesus, Lord of Pskov, and Grand Prince of Smolensk, Lithuania, Volhynia, Podolia, and Finland; Prince of Estonia, Livonia, Courland and Semigalia, Samogitia, Bielostok, Karelia, Tver, Yugor, Perm, Vyatka, Bogar and others; Sovereign and Grand Prince of Nizhni Novgorod, Chernigov, Ryazan, Polotsk, Rostov, Jaroslavl, Beloozero, Udoria, Obdoria, Kondia, Vitebsk, Mstislav, and Ruler of all the Severian country; Sovereign and Lord of Iveria, Kartalinia, the Kabardian lands and Armenian province: hereditary Sovereign and Possessor of the Circassian and Mountain Princes and of others; Sovereign of Turkestan, Heir of Norway, Duke of Schleswig-Holstein, Stormarn, Dithmarschen, and Oldenburg, and so forth, and so forth, and so forth." Emperor Nicholas II Land in a 1915 map of the Russian Empire. Back then it was believed that what is now Severnaya Zemlya was a single landmass. Emperor Nicholas II Land (Russian: Земля Императора Николая II, Zemlya Imperatora Nikolaya II) was discovered in 1913 by the Arctic Ocean Hydrographic Expedition led by Boris Vilkitsky on behalf of the Russian Hydrographic Service. Still incompletely surveyed, the new territory was officially named in the Emperor's honour by order of the Secretary of the Imperial Navy in 1914. 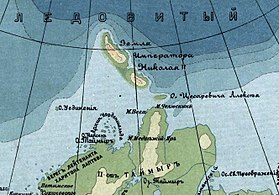 The archipelago was renamed "Severnaya Zemlya" in 1926 by the Presidium of the Central Executive Committee of the Soviet Union. 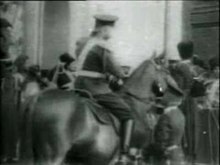 After his coronation, Nicholas II leaves Dormition Cathedral. The Chevalier Guard Lieutenant marching in front to the Tsar's right is Carl Gustaf Mannerheim, later President of Finland. 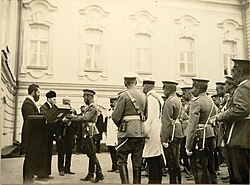 Nicholas II was granted honorary senior rank in a number of foreign armies, reciprocating by extending similar distinctions to a number of his fellow monarchs. These included the Imperial German, Spanish, Italian, Danish and British armies. He was Colonel-in-Chief of the Royal Scots Greys from 1894 until his death. On becoming Colonel-in-Chief he presented the Regiment with a white bearskin, now worn by the bass drummer of the Pipes and Drums of the Royal Scots Dragoon Guards. The Imperial Russian anthem is still played at dinner nights in the Officers' Mess, where there remains a portrait of the Tsar in Scots Greys uniform. Since his death, the Regiment has worn a black backing behind its cap badge as a symbol of mourning. Estimates of Nicholas II's personal wealth have been vastly exaggerated. As Emperor of All The Russias, and an autocrat, the resources under his command were virtually incalculable. However, the vast majority of this was owned by the state as Crown property; the Romanov family's personal wealth was only a small fraction of this. As monarch, the income of Nicholas was 24 million gold roubles per annum: this derived from a yearly allowance from the Treasury, and from the profits of Crown farmland. From this income, he had to fund staff, the upkeep of imperial palaces and imperial theatres, annuities for the royal family, pensions, bequests, and other outgoings. "Before the end of the year, the Tsar was usually penniless; sometimes he reached this embarrassing state by autumn." According to the Grand Marshal of the Court, Count Paul Benckendorff, the family's total financial resources amounted to between 12.5 and 17.5 million roubles. As a comparison, Prince Felix Yusupov estimated his family's worth in real estate holdings alone as amounting to 50 million gold roubles. Several films about Nicholas II and his family have been made, including Anastasia (1956), Nicholas and Alexandra (1971), Anastasia: The Mystery of Anna (1986), Rasputin: Dark Servant of Destiny (1996 HBO), Anastasia (1997), and two Russian adaptations Assassin of the Tsar (1991) and The Romanovs: An Imperial Family (2000). In 2017 the film Matilda (2017 film) was released. ^O.S./N.S. Over the course of Nicholas's life, two calendars were used: the Old Style Julian Calendar and the New Style Gregorian Calendar. Russia switched from the Julian to the Gregorian calendar on 1 February (O.S.) / 14 February (N.S.) 1918. ^ The date was 2 March 1917 in the Julian Calendar then in use in Russia, which is the same day as 15 March 1917 in the Gregorian Calendar used elsewhere at that time. ^ a b Kallistov, D. P. (1977). History of the USSR in Three Parts: From the earliest times to the Great October Socialist Revolution. Progress Publishers. [page needed]. 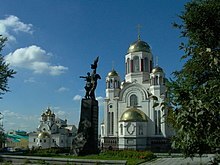 ^ "Orthodox Terminology", Church of the Mother of God. Churchmotherofgod.org. Retrieved on 5 December 2018. ^ The letters of Tsar Nicholas and Empress Marie: being confidential correspondence between Nicholas II, last of the Tsars, and his mother, Dowager Empress Maria Feodorovna. Edward J. Bing (ed.). London: Nicholson and Watson, 1937. ^ 1 March 1881 in the Julian Calendar then in use in Russia, which is the same day as 13 March 1881 in the Gregorian Calendar used elsewhere at that time. ^ "THE HEALTH OF THE CZAR". Western Daily Press. 15 February 1894. Retrieved 10 March 2016 – via British Newspaper Archive. (Subscription required (help)). ^ "The Czarewitch". St James's Gazette. 30 July 1894. Retrieved 11 March 2016 – via British Newspaper Archive. (Subscription required (help)). ^ "THE CZAR AND PRINCESS ALIX. ANOTHER MANIFESTO". Exeter and Plymouth Gazette. 5 November 1894. Retrieved 11 March 2016 – via British Newspaper Archive. (Subscription required (help)). ^ Feinstein, Elaine (2006). Excerpt from Anna of All the Russias. Vintage. ISBN 978-1-4000-3378-2. ^ "CZAR ALEXANDER'S FUNERAL". Sheffield Evening Telegraph. 20 November 1894. Retrieved 11 March 2016 – via British Newspaper Archive. (Subscription required (help)). ^ Massie (1967) p. 42. ^ Radziwill, Catherine (1931) Nicholas II, The Last of the Tsars, London: Cassell And Company Ltd., p. 100. ^ The Nomination Database for the Nobel Prize in Peace, 1901–1956. Nobelprize.org. Retrieved on 1 May 2014. ^ a b c d e f g h Kowner, Historical Dictionary of the Russo-Japanese War, p. 260-264. ^ "Beyond the Pale: The Pogroms of 1903–1906". Retrieved 17 July 2008. ^ a b c Cf. : Massie (1967) p. 125. — Massie's translation is not authentic. ^ "State Archive of the Russian Federation, ф.601.ОП.1, д.248. Diary of Nickolas Romanov. 9 January 1905. (in Russian)". Militera.lib.ru. Retrieved 25 October 2010. ^ Kenez, Peter (1999) A History of the Soviet Union From the Beginning to the End, Cambridge University Press, ISBN 0521311985, p. 7. This was especially true among the illiterate peasantry or 'dark masses' who although they followed their own (almost pagan) rituals, had until this point held complete naive faith in the Tsar. ^ История России в портретах. В 2-х тт. Т.1. с.285–308 Сергей Витте. Peoples.ru (9 April 2006). Retrieved on 2018-12-05. ^ Features And Figures Of The Past Covernment And Opinion In The Reign Of Nicholas II. Archive.org (21 July 2010). Retrieved on 2018-12-05. ^ "Nicolas' diary 1905 (in Russian)". Rus-sky.com. Retrieved 28 April 2013. ^ a b c Massie (1967) p. 247. ^ Klein, Ira (1971). "The Anglo-Russian Convention and the Problem of Central Asia, 1907–1914". Journal of British Studies. 11 (1): 126–147. JSTOR 175041. ^ Josef und Ulli. "Germany during World War One". Archived from the original on 18 October 2009. Retrieved 7 September 2009. ^ Gareth Russell (2014). The Emperors: How Europe's Rulers Were Destroyed by the First World War. Amberley. pp. 164–65. ISBN 9781445634395. ^ Massie (1995) p. 8. ^ Massie (1995) p. 6. ^ Alexander, Robert (2003). The Kitchen Boy: A Novel of the Last Tsar. Penguin Group US. ISBN 978-1-101-20036-0. ^ Telegraph quoted in The Kitchen Boy by Robert Alexander (unpaginated). ^ Robert K. Massie (2012). The Romanovs: The Final Chapter. Modern Library. p. 34. ISBN 978-0-679-64563-4. ^ Coble, MD (2011). "The identification of the Romanovs: Can we (finally) put the controversies to rest?". Investig Genet. 2 (1): 20. doi:10.1186/2041-2223-2-20. PMC 3205009. PMID 21943354. ^ "Экспертиза подтвердила, что найденные останки принадлежат Николаю II" (in Russian). ITAR-TASS. 5 December 2008. Archived from the original on 7 August 2011. ^ Coble, M. D.; Loreille, O. M.; Wadhams, M. J.; Edson, S. M.; Maynard, K.; Meyer, C. E.; Niederstätter, H.; Berger, C.; Berger, B.; Falsetti, A. B.; Gill, P.; Parson, W.; Finelli, L. N. (2009). "Mystery Solved: The Identification of the Two Missing Romanov Children Using DNA Analysis". PLoS ONE. 4 (3): e4838. doi:10.1371/journal.pone.0004838. PMC 2652717. PMID 19277206. ^ "Famous DNA". Isogg.org. Retrieved 25 October 2010. ^ Parsons TJ, Muniec DS, Sullivan K, Woodyatt N, Alliston-Greiner R, Wilson MR, Berry DL, Holland KA, Weedn VW, Gill P, Holland MM (1997). "A high observed substitution rate in the human mitochondrial DNA control region". Nature Genetics. 15 (4): 363–8. doi:10.1038/ng0497-363. PMID 9090380. ^ Harding, Luke (25 August 2007). "Bones found by Russian builder finally solve riddle of the missing Romanovs". The Guardian. London. Retrieved 20 May 2010. ^ a b "DNA Confirms Remains of Tsar's Children". CBS News. Associated Press. 30 April 2008. Retrieved 28 September 2007. ^ Details on further testing of the Imperial remains are contained in Rogaev, E.I., Grigorenko, A.P., Moliaka, I.K., Faskhutdinova, G., Goltsov, A., Lahti, A., Hildebrandt, C., Kittler, E.L.W. and Morozova, I., "Genomic identification in historical case of the Nicholas II royal family. ", Proceedings of the National Academy of Sciences, (2009). ^ "Last Tsar's family rehabilitated". Russiatoday.com. 1 October 2008. Archived from the original on 24 January 2009. Retrieved 7 September 2009. ^ "Russia's Last Tsar Declared Victim of Repression". TIME. Archived from the original on 14 January 2009. Retrieved 7 September 2009. ^ "DNA proves Bolsheviks killed all of Russian Tsar's children". CNN. 22 December 2008. ^ "Russia readies to exhume Tsar Alexander III in Romanov probe". AFP.com. Agence France-Presse. 3 November 2015. Archived from the original on 9 November 2015. ^ "Russia exhumes bones of murdered Tsar Nicholas and wife". BBC News. BBC. 24 September 2015. Retrieved 28 June 2018. ^ New DNA tests establish remains of Tsar Nicholas II and wife are authentic. Ibtimes.co.uk (15 November 2015). Retrieved on 2018-12-05. ^ DNA Testing Verifies Bones of Russia's Last Tsar. Themoscowtimes.com. Retrieved on 5 December 2018. ^ "Romanovs laid to rest". BBC News. 17 July 1998. ^ a b Massie (1995) pp. 134–135. ^ Esthus, Raymond A. (1981). "Nicholas II and the Russo-Japanese War". Russian Review. 40 (4): 396–411. JSTOR 129919. ^ Tuchman, Barbara W. The Guns of August. New York: Presidio Press, 1962, p.71. ^ Massie (1967) pp. viii–x. ^ a b c d "Christian IX". The Danish Monarchy. Archived from the original on 3 April 2005. Retrieved 14 July 2018. ^ a b Zeepvat, Charlotte. Heiligenberg: Our Ardently Loved Hill. Published in Royalty Digest. No 49. July 1995. ^ a b Vammen, Tinne (2003-05-15). "Louise (1817–1898)". Dansk Biografisk Leksikon (in Danish). Phillips, Walter Alison (1911). "Nicholas I." . In Chisholm, Hugh. Encyclopædia Britannica. 19 (11th ed.). Cambridge University Press. ^ a b Barkovets, 1=Olga; Vernova, Nina (2008). Empress Alexandra Fiodorovna. Abris Art Publishers. p. 8. ISBN 978-5-88810-089-9. ^ a b Badische Biographien. 1. 1875. pp. 18–19. ^ a b Louda, Jiří; Maclagan, Michael (1999). Lines of Succession: Heraldry of the Royal Families of Europe. London: Little, Brown. table 20. ISBN 978-1-85605-469-0. ^ a b McNaughton, C. Arnold (1973). The Book of Kings: A Royal Genealogy, in 3 volumes. 1. London: Garnstone Press. p. 171. ^ a b Lesser, Joh. "Vilhelm, Landgreve af Hessen-Kassel". In Bricka, Carl. Dansk biografisk Lexikon (in Danish). XVIII. ^ a b Thorsøe, A. "Charlotte (Louise C.)". In Bricka, Carl. Dansk biografisk Lexikon (in Danish). III. 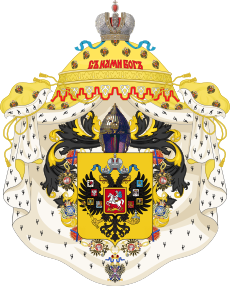 ^ "On the Title of His Imperial Majesty and the State Coat of Arms", Russian Imperial House: Official site of the Romanov Dynasty. Retrieved 9 August 2018. ^ Barr, William (1975). "Severnaya Zemlya: the last major discovery". Geographical Journal. 141 (1): 59–71. doi:10.2307/1796946. JSTOR 1796946. ^ Архипелаг Северная Земля — один из наиболее крупных районов оледенения на территории России. My.krskstate.ru. Retrieved on 5 December 2018. ^ "Депутаты Законодательного собрания Красноярского края против переименования островов архипелага "Северная Земля"". newslab.ru (in Russian). 27 May 2007. Retrieved 12 August 2015. ^ Pedersen, Jørgen (2009). Riddere af Elefantordenen, 1559–2009 (in Danish). Syddansk Universitetsforlag. p. 299. ISBN 978-87-7674-434-2. ^ "Romanov Nicola II Czar di Russia" (in Italian), Il sito ufficiale della Presidenza della Repubblica. Retrieved 5 August 2018. ^ "Image: carol-i-nicholas-ii.jpg, (500 × 315 px)". royalromania.files.wordpress.com. Retrieved 6 September 2015. ^ "Toison Espagnole (Spanish Fleece) – 19th century" (in French), Chevaliers de la Toison D'or. Retrieved 9 August 2018. ^ "The London Gazette, Issue: 27711 Page: 5775". The London Gazette. Retrieved 19 April 2018. ^ "Russian honours: Emperor Nicholas II of Russia". Received 26 November 2018. ^ Clarke, William The Lost Fortune of the Tsars, St. Martin's Griffin; Reprint edition, 1996, p101. Figes, Orlando (2015). A People's Tragedy: The Russian Revolution 1891–1924. The Bodley Head. King, Greg (1994). The Last Empress. Birch Lane Press. King, Greg (2006). The Court of the Last Czar: Pomp, Power and Pageantry in the Reign of Nicholas II. John Wiley & Sons. Kowner, Rotem (2006). Historical Dictionary of the Russo-Japanese War. The Scarecrow Press. ISBN 978-0-8108-4927-3. Lieven, Dominic (1993). Nicholas II, Emperor of all the Russias. London: Pimlico. Massie, Robert K. (1967). Nicholas and Alexandra. Massie, Robert K. (1995). The Fate of the Romanovs: The Final Chapter. Random House. ISBN 978-0-394-58048-7. Radzinsky, Edvard (1992). The Last Tsar. New York, NY: Doubleday. p. 431. ISBN 978-0-385-42371-7. Tames, Richard (1972). Last of the Tsars. London: Pan Books Ltd.
Warth, Robert D. (1997). Nicholas II, The Life and Reign of Russia's Last Monarch. Praeger. ISBN 978-0275958329. Dominic Lieven, Nicholas II: Emperor of All the Russias. 1993. John Curtis Perry and Konstantin Pleshakov, The Flight of the Romanovs. 1999. Edvard Radzinsky, The Last Tsar: The Life and Death of Nicholas II (1992) ISBN 0-385-42371-3. Samten, Jampa. (2010). "Notes on the Thirteenth Dalai Lama's Confidential Letter to the Tsar of Russia." In: The Tibet Journal, Special issue. Autumn 2009 vol XXXIV n. 3-Summer 2010 vol XXXV n. 2. "The Earth Ox Papers", edited by Roberto Vitali, pp. 357–370. Mark D. Steinberg and Vladimir M. Khrustalev, The Fall of the Romanovs: Political Dreams and Personal Struggles in a Time of Revolution, New Haven: Yale University Press, 1995. Anthony Summers and Tom Mangold, The File on the Czar. 1976. Nicky-Sunny Letters: correspondence of the Czar and Czaritsa, 1914–1917. Hattiesburg, Miss: 1970. Willy-Nicky Correspondence: Being the Secret and Intimate Telegrams Exchanged Between the Kaiser and the Czar. Ed. Herman Bernstein. New York: 1917. Page, Walter Hines; Page, Arthur Wilson (October 1904). "The Personality of the Czar: An Explanation, By A Russian Official Of High Authority". The World's Work: A History of Our Time. VIII: 5414–5430. Wikimedia Commons has media related to Nicholas II of Russia. Wikisource has the text of the 1922 Encyclopædia Britannica article Nicholas II.. The Execution of Czar Nicholas II, 1918, EyeWitness to History. Frozentears.org A Media Library to Nicholas II and his Family. (in Russian) The Murder of Russia's Imperial Family, Nicolay Sokolov. Investigation of execution of the Romanovs in 1918. (in Russian) Nikolay II — Life and Death, Edvard Radzinski. Later published in English as The Last Czar: the Life and Death of Nicholas II. (in Russian) Memoirs: The reign of Nicholas II 1–12 13–33 34–45 46–52 (incomplete), Sergei Witte. It was originally published in 1922 in Berlin. No complete English translations are available yet. New Russian Martyrs. Czar Nicholas and His Family. A story of life, canonisation. Photoalbum. Russian History Magazine Articles about the Romanovs from Atlantis magazine. The coronation of Emperor Nicholas II. 26 (14, old style), may, 1896. Historical photos.